Winter is almost here, so how about a ski story? Last March we packed the car and set out on a two-week ski odyssey around British Columbia and Alberta, Canada. It wasn’t just any car. It was a Chevy Suburban of Secret Service caliber — black, with tinted windows and enough room to fit all the president’s men. We debated with the rental car company about the vehicle being TOO big and even drove it back to try to exchange it for something smaller. When we returned to Budget Rent-a-Car, the irony was thick. Here was a lovely Budget employee from India, about five feet tall standing next to the Chevy Monstrosity, who had never skied a day in his life yet insisted this was the perfect four-wheel drive vehicle for our trip. His enthusiasm was so irresistible, we went with it. And it turns out he was absolutely right. Not only did the Secret Service Ski Suburban (SSSS) accommodate the obscene amount of gear and clothing we had for every foreseeable winter condition, but it also gave us a real sense of setting out on an epic road trip through the Canadian Rockies. We don’t own a car, so suddenly having our hands gripped on the steering wheel of the most massive winter expeditionary vehicle was like … Yes! We are doing this! And it’s going to be awesome. 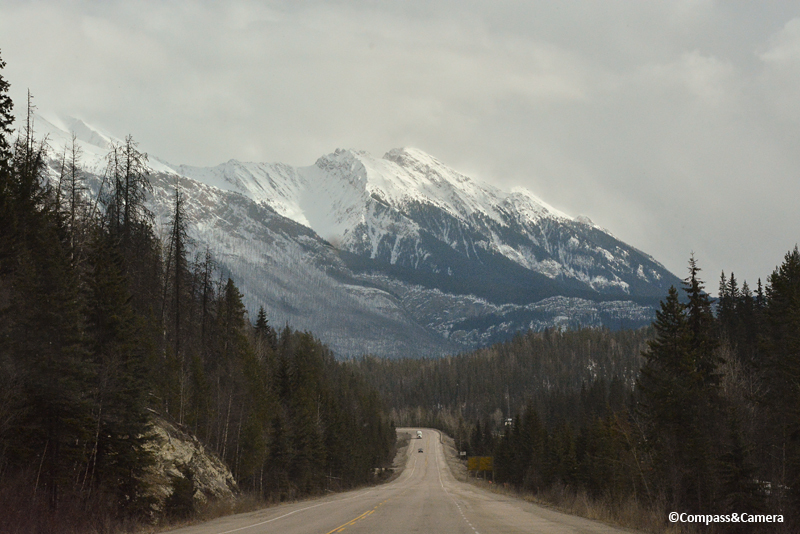 We drove from Vancouver to Kelowna to Revelstoke to Golden to Lake Louise to Nelson to Osoyoos and back to Vancouver. We skied Big White, Revelstoke and Kicking Horse, and J also indulged in a day of heli-skiing in the Selkirk Mountains. Lucky for us, March was a winter wonderland with great ski conditions throughout the trip and we also enjoyed a couple of snowy days at the Fairmont Lake Louise. Big White hulks with mass — it is not a steep mountain, but a heavy blanket of snow transforms the upper reaches into a bizarre and beautiful landscape. The snow entirely engulfs the trees, kind of like that clumpy white flocking on fake Christmas trees. Known as “snow ghosts” with their unusual costumes, the trees resemble everything from dinosaurs to shrimp tempura (bang on description, J). The tree skiing at Big White is fantastic — again, not too steep and not too fast, with dips and dives like little roller coasters off every run. With such beautiful terrain, even riding the lifts at Big White was enjoyable. From Big White we pointed the SSSS to Revelstoke. We passed some bighorn sheep along the way and pulled into our hotel in the early evening as flurries began to fly. Revelstoke is an old mining town still clinging to its identity and character. The architecture retains the style and scale of years past, and the shops and restaurants have a friendly, welcoming charm rarely found in bigger cities. No stop in Revelstoke would be complete without at least one visit to the Village Idiot Bar and Grill for great food and hospitality. We hit the mountain in the morning and although the sun wasn’t shining, the runs were empty and easy to cruise. The slopes at Revelstoke Mountain Resort are much steeper and more difficult than Big White. Off-piste terrain is plentiful and you might even come across a cliff here and there — but they’ll try to warn you with a tiny orange sign. Pay attention! After Revelstoke, we drove on to Kicking Horse in Golden, BC. This resort was my favorite of the trip. It’s heavy on the double black diamonds and, with wide open bowls, there are endless lines to ski and lots of drop-ins to make your runs just a little more thrilling. The Stairway to Heaven lift gives a scenic view of the entire Crystal Bowl and the view from the top explains how the lift got its name. What I enjoyed the most (aside from no lift lines) was dropping into Feuz Bowl and looking back at the massive panorama behind us. From Kicking Horse, we hurried over to lake Louise for two days of luxury next to the lake. We arrived on a beautiful, blustery afternoon. After banging around in ski boots for more than a week, it was nice to warm our toes in the comfort of the Fairmont. Winter cocktails and fondue made it extra wonderful. Because who doesn’t love hot cheese in the middle of winter? Lake Louise Ski Resort is just across the highway from the Fairmont, but with so much fun right outside our hotel door we never did make it to that mountain. Lake Louise was frozen and covered in snow, inviting a walk across to the other end. The Fairmont had also constructed a magnificent ice castle on the lake, inspiring people to play, pose and get outside to experience the beauty of winter. With a sense of adventure and a few shots of Fireball, who knew a frozen lake could be so fun? Happy winter everyone! Let’s get outside, point our feet downhill and see where the next adventure takes us. 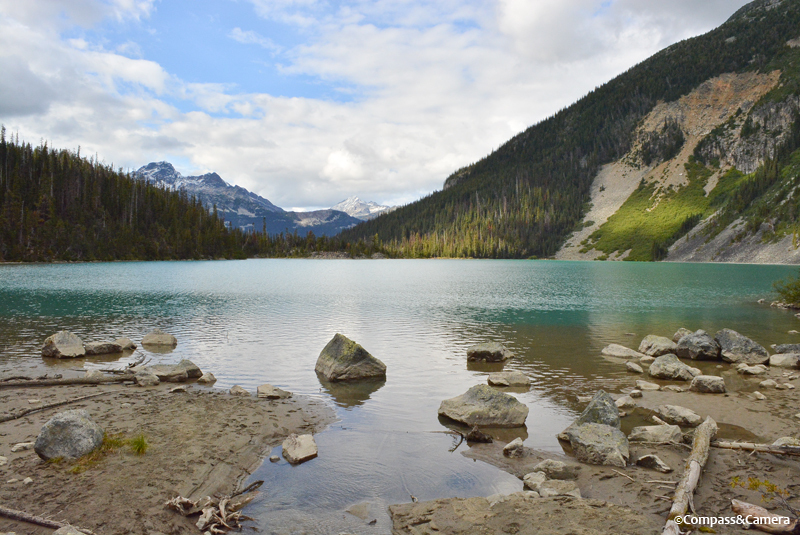 Just a couple hours from Vancouver, our group finds the trailhead and sets out into the forest seeking a trio of glacial lakes in Joffre Lakes Provincial Park. The lower lake appears just ahead, not far from our starting point — a little amuse bouche of what’s farther up the trail. Reed grass paints a lime green swath through the water while the sun hides behind clouds just above the mountains. We continue on the trail — easy under foot and blanketed by thick undergrowth on both sides. The park clearly sees a lot of precipitation as the vegetation looks almost like a rainforest. The trail shifts into high gear and we’re soon progressing through a valley on a steep incline. Getting to the middle lake is an uphill haul, but the views entice and encourage and we find ourselves at the shore, out of breath. A glacial lake is a sight to behold, anywhere in the world. Deep blue-green and opaque, it’s not only hard to describe but hard to believe even when seeing it in person. The blue tones accentuate the yellow in the vegetation surrounding the lake, and it seems today that even my camera is having difficulty interpreting the values of this extraordinary landscape. It just doesn’t look real. Just up the trail, water cascades down through the trees along a nearly perfect staircase waterfall. The sky tries to clear and we continue on our way to Upper Joffre Lake. The highest lake offers the greatest reward, with a view into a cirque topped by an old glacier. It’s the perfect place to stop for lunch so we settle on a coarse moraine next to the trail. The sun finally shines and hits the water like a spotlight — blue-green changing to aqua in a brilliant show of colors. The glacier holds a hint of icy blue and with my long lens I see the many layers of winters past fused together in a moving, melting canvas. We explore the campground at the far end of the lake (paradise!) and then begin our descent back to our starting point. It’s such a thrill to find wilderness so easily reached from Vancouver. It’s just the beginning of my adventure here and Canada’s backcountry is vast. I think there’s plenty to keep me busy for however long I’m here.